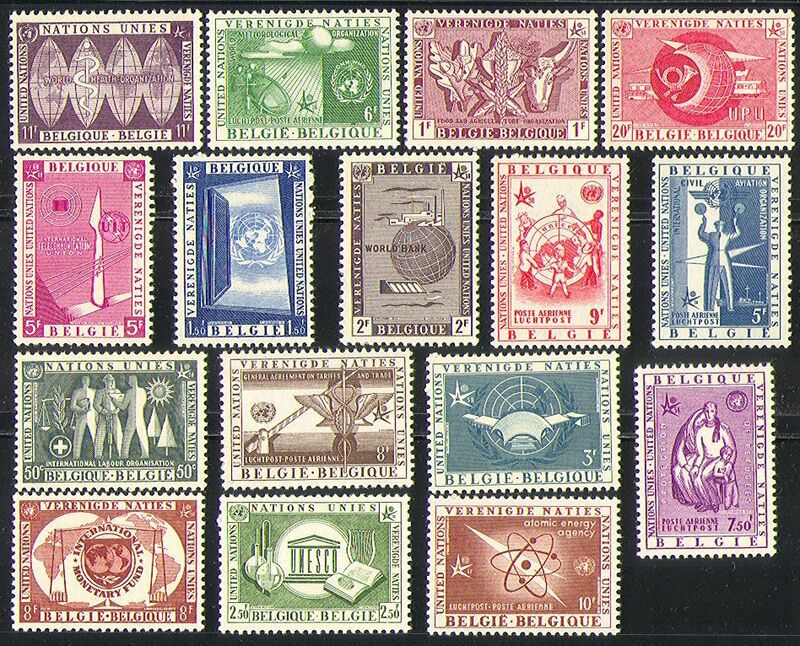 Belgium 1958 United Nations Commemoration 16 value set depicting WHO (Health), UPU (Post / Mail), ITU-UIT (Telecommunications), FAO (Food / Hunger), UNICEF, UNESCO, Refugees, WMO / IMO (Meteorology), IMF (Banks / Money), GATT (Business / Commerce), Atomic Energy Agency (Nuclear Power), ICAO (Aviation), ILO and Exhibition Pavillion - in superb u / m (mnh) condition - excellent country, medical, health, welfare, transport, trains, rail, bus, planes, telecomms, science, heritage, commerce, people, animation thematics. If you cannot find the specific stamp set or thematic/topic you are looking for either here in my shop or at the brumstamp stamp shop on eBay http://stores.shop.ebay.co.uk/The-Brumstamp-Stamp-Shop please do nothesitate to contact me. Enjoy browsing and shopping. Andrea!